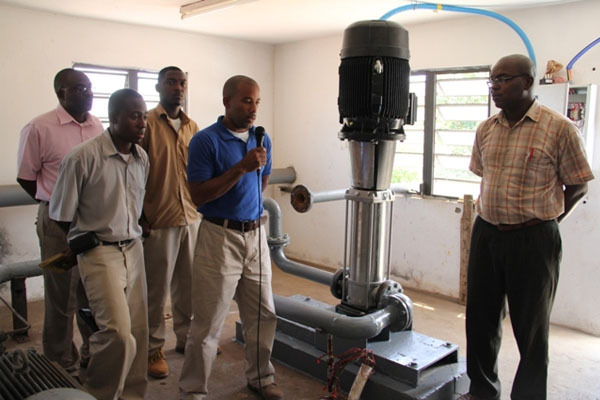 NIA Charlestown Nevis — In an effort to provide the people of Nevis with an improvement in the water production, the Nevis Water Department, through the Ministry of Finance procured a new and improved Booster Pump at the Fothergills Water Pumping Station. In an interview with the Department of Information on March 07, 2014, at the Fothergills Pumping Station, Manager of the Nevis Water Department Roger Hanley explained the functions of the new pump. “Back in 2012, in December, we suffered a failure with one of the three boosters and we sought approval from the Ministry of Finance to order a new pump. In the interim, we had to develop an alternative solution to put a submersible pump in a 3000 gallon water tank that is outside the premises, outside the pump house,” he said. “During the period of the 3rd to the 7th of this week, we had technicians from our Department from the Pump Division and who were working tirelessly to establish the new booster pump that we purchased from the Spanish company Grundfos. This new pump was a replacement for one of the old pumps that got damaged in 2012…This pump will pump an extra 205 gallons of water to the Stoney Hill reservoir,” he said. Mr. Hanley stated that the newly installed pump was currently pumping more water into the Fothergills area than the previous pump. “This new pump has been recorded to pump 205 imperial gallons per minute. Previously with the installation of the alternative solution, we recorded close to the Stoney Hill reservoir, 410 gallons per minute but with the installation of this new pump, we would have pushed an extra 50 gallons per minute; an extra 72, 000 gallons per day to the Stoney Hill reservoir,” he said. Permanent Secretary in the Ministry of Communication and Works, Ernie Stapleton expressed his contentment with the new water pump installation. “I must say that I am very happy that we are at the stage that we got to this pump because we have been trying to procure, purchase this pump to install here and finally it is here…This is not necessarily part of the Caribbean Development Bank project. This is part of the day-to-day maintenance of the Water Department. “The CDB project would give us another pump house on this very spot but you know the system has to be maintained, as we continue to develop and expand when it comes to the enhancement of the water supply on the island of Nevis. So I am very happy that we are at this stage,” he said.